If you are looking for a quick retreat from the busy city life, a drive to a backcountry road can be very therapeutic. In this case, consider going to Bucks County, located east of Pennsylvania. Rich in scenic beauty and babbling brooks, creaks and streams dating back to the older times; it is probably that you may stumble upon covered bridge when you are just riding along. Riding across a covered bridge or visiting a historic home can be that gateway to the late 1800s when the pace of the world was so much slower. The covered bridges in Bucks County also provide great opportunities. Below is a list of some of the most popular bridges in the county. Erwinna Covered Bridge. The Erwinna Covered Bridge is located close to the Tinicum County Park, making this a great side trip when visiting the park. Going upstream from here is where Geigel Hill Road meets upper Tinicum Church Road. Frankenfield Covered Bridge. One of the most picturesque bridges in the county, Frankenfield Covered Bridge crosses the convergence of Cafferty Road and Hollowhorn Road in the Tinicum Township. Municipal Road crosses Tinicum Creek but it has no bridge. Knecht’s Covered Bridge. The Cook’s Creek passes through the Durham and Springfield Townships in the upper portion of the county. Along the way, you will pass through local history in the hillsides. The Knecht’s Covered Bridge crosses Cook’s Creek in Springfield Township. Loux Covered Bridge. The Loux Covered Bridge is one of the smaller ones in the county, and you will find it suddenly as you follow the twists and turns of Wismer Road going toward Cabin Run on the Bedminster border. This creek is crossed by the covered bridge of Cabin Run downstream. Mood’s Covered Bridge. Situated on Blooming Glen Road, Mood’s Covered Bridge crosses the Perkiomen Creek. With its location almost in Perkaise, you might find yourself experiencing a high volume of traffic as you make your way to it. Pine Valley Covered Bridge. 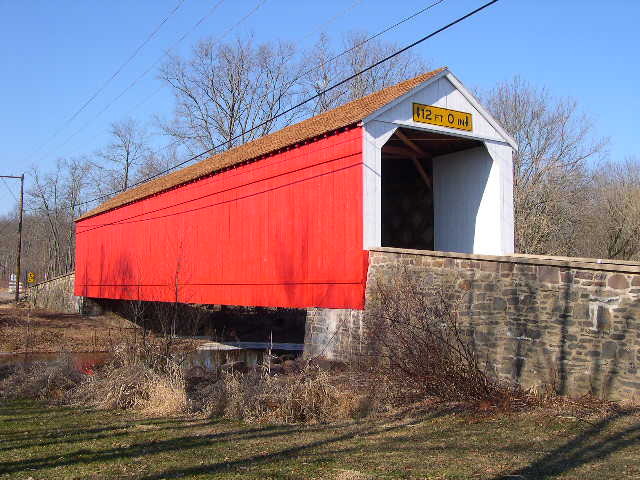 The Pine Valley Covered Bridge is located at the intersection of Doylestown Township, New Britain Borough and New Britain Township. This bridge crosses Pine Run on Old Iron Hill Road, where you will find a small park that gives a better look at the bridge. Schofield Covered Bridge. Crossing Neshaminy Creek in Tyler State Park, the Schofield Covered Bridge is a reproduction of the original after the latter was destroyed in a fire in 1991. Today, this bride is only open to foot and equestrian traffic. As you make your way to these covered bridges, you are bound to come upon several historic homes for sale that are just as interesting. Contact real estate listings in Bucks County if you are interested in any of them. Also check out the homes for sale in New Hope. Check out a New Hope PA video on YouTube that will give you a good look at the history of this area. If you want to, you can even build custom homes in Bucks County, and situate it near your favorite covered bridge.